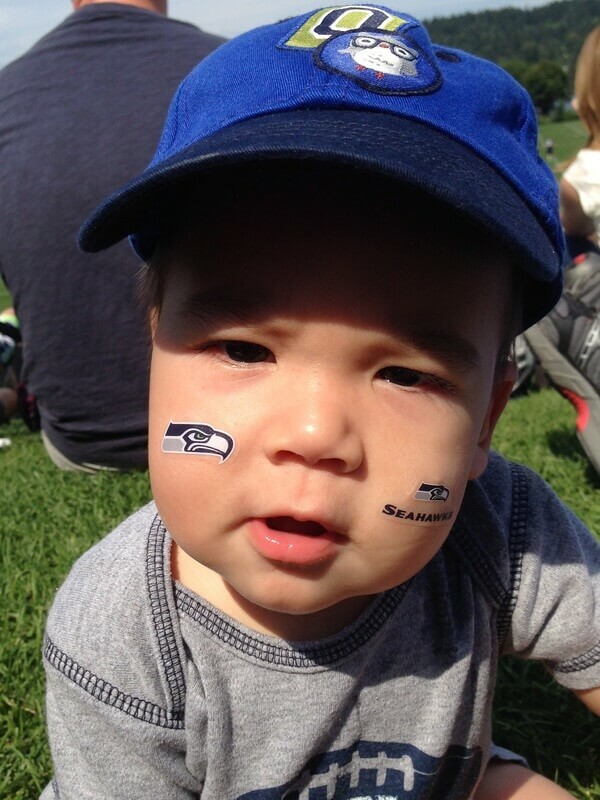 The Seahawks are a big deal in my family. 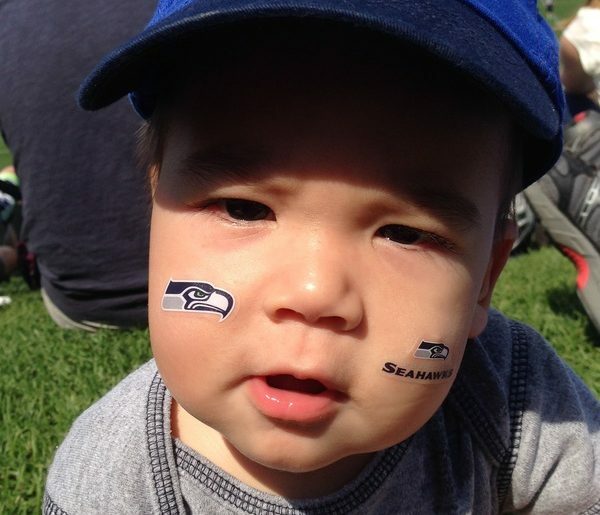 My husband has been a life-long fan (attending the Seahawks Training Camp several times) and I became one when we met (after attending the Seahawks Football 101 event). Owen was supposed to be born on Super Bowl weekend, but he came early and was able to watch the Seahawks win their first Superbowl. 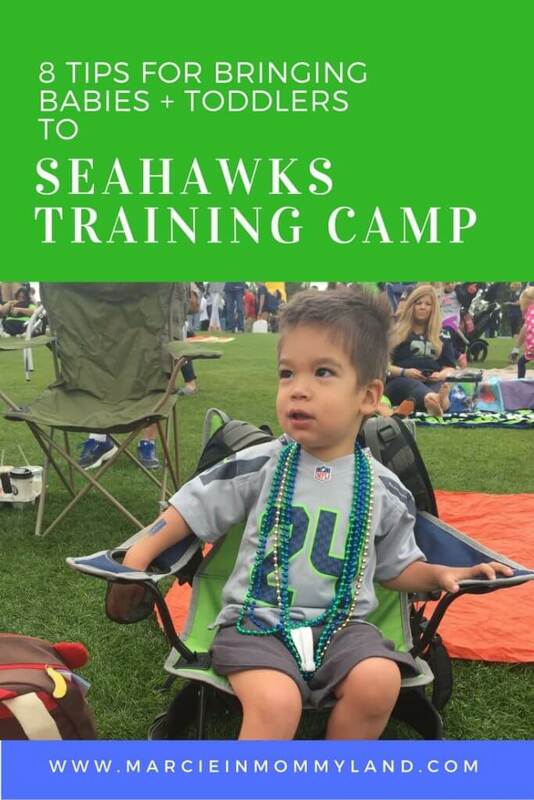 We have been fortunate to have the opportunity to take our son to Seahawks Training Camp every year of his life, so far. The first year, I got a ticket to the sold-out event from a co-worker of a family friend. Owen was 8 months old and I strapped him in my baby carrier. It was a really hot day and he was a bit overheated. 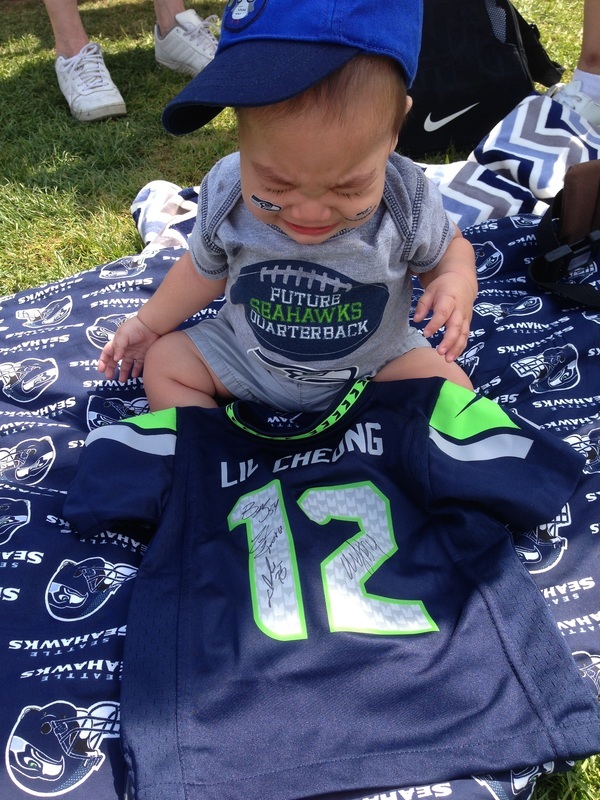 I happened to bring his little customized Seahawks jersey that said “Lil Cheung” on the back. Marshawn Lynch autographed it for him! This was a big deal because this was the first practice he had attended. He only signed autographs for a few fans. 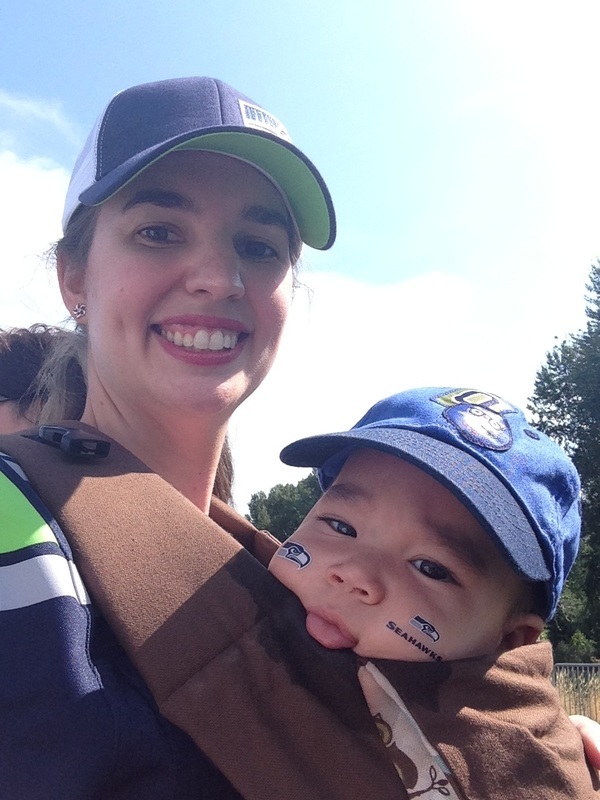 The next year, I was able to secure Seahawks Training Camp tickets for our family and another family with a newborn. We thought ahead and brought a blanket to sit on, lots of sunscreen and snacks. Owen enjoyed it even more because he was able to dance to the music and do a lot of people watching. This year, we’re planning on bringing a blanket and getting there early so we can sit closer to the fence at Seahawks Training Camp. We will also bring water, sunscreen and lots of snacks. There are also usually inflatables for younger kiddos. I’m also going to bring a photo matte board and see if I can get players to autograph it. Then, I’ll put a photo of our family dressed in our Seahawks gear in it and hang on our wall. Get Tickets Early: Tickets sell out quickly, so grab your tickets as soon as they are available. Kids 2 and under are free. Pack Essentials: Bring lots of sunscreen, sunglasses, a hat and something to sit on. Snacks and drinks are optional, as there are usually vendors available. You can bring a backpack, small cooler, stroller and chairs. Park Early: There is a lot of parking available at The Landing in Renton, however the spots fill up quickly with Training Camp attendees and patrons of the stores located at The Landing. Claim your Spot: The viewing area is on a hill. If you have a baby that will be laying on a blanket, you might want to find a spot that’s a bit flatter so you won’t have to constantly put your baby back on the blanket. For older toddlers, it might be nice to be closer to all the activities. There are No Designated Nursing/Changing Areas: Just a heads up. I’ve never had a problem nursing my son or changing his diaper on our blanket while watching practice. There are a lot of trashcans nearby for diaper disposal. Walk Around: If your kids are getting antsy, get up and move around. There is a Pro Shop, food/drinks, and lots of vendor booths. Bring a Sharpie: If you’d like to get autographs at the end of Training Camp, the players are usually more than happy to meet fans. But, you’ll need to bring your own pen and something for them to sign. If you want them to sign your jersey, you might clip it to a clipboard or other hard surface, as they won’t have a hard surface to write on. Bring your Camera: There are many fun photo ops at Training Camp. The SeaGals and Blitz are usually there for posed photos and they have lots of signs and cutouts specifically for photos. I usually just use my iPhone, but you can bring a camera as long as the lens is under 12″.